It seems as though we're only beginning to catch up with Chris Byars. That's our fault. Byars-the-artist himself was established in New York first at age 7 with the Metropolitan Opera, New York City Opera, and later with George Balanchine. His career between ages 7-14 encompasses over a thousand performances around the world. He starred notably in Balanchine's production of The Spellbound Child (L'Enfant et les Sortileges), which the New York Times (5/25/81) called "...quite magical and enchanting...a television classic." I think it's fair to say he was a prodigy. The continuation of his musical and artistic career as a composer, arranger, and multi-saxophonist for over 20 years has been just as distinguished. This is where we walked in. Now Chris Byars is one of the most brilliant players alive today, in a league with the late Frank Hewitt and very few others. 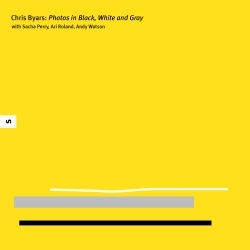 We've documented some of Byars' art in previous releases (Across 7 Street-Made In New York/SRCD-0002; Sasha Dobson with the Chris Byars Octet-The Darkling Thrush/SRCD-0005; The Frank Hewitt Quintet-Four Hundred Saturdays/SRCD-0010; The Chris Byars Octet-Night Owls/SRCD-0013; Ari Roland-Sketches From a Bassist's Album/SRCD-0012). Here though is the first small group record documenting Byars exclusively on compositions from his book. But that's a big book, so catching up is going to take a while. A window into the Smalls scene in the 90s, the tunes were played by the Across 7 Street Septet, which later became a Quintet around 1997. For me, they are like an album of recent pictures printed in grayscale, the crisp lines and absence of color alerting one to the brevity of the present day. These originals are snapshots of an epoch just passed, a time very dear to the hearts of many New Yorkers that love jazz. They were conceived of recreationally, in the root sense of the word; they are "second creations" in the jazz idiom as it existed in New York in the 1940s, 50s and 60s, with the added insight that the future, in which we live, provides. From 1994-2003, a fortunate set of young musicians (of which I was part) was granted an ideal musical forum, through seemingly endless bandstand time and a low expectation of public appreciation. Smalls Club Owner Mitchell Borden believed, perhaps naively, in some unknown eventual solution to his financial woes, and adopted the "hang-in-there" approach to his steady bands, offering two, three, even four band slots nightly. Another stroke of luck came to pass: the "local talent" began to show up, and in New York City, this means the people that helped shape the music decades ago. This contingent had weathered the decades of public ignorance with style and confidence, their musicianship surviving exclusively on their own individual drive and spirit, developing and refining all along the way. "Know how I got that sound? I never stopped. NEVER STOPPED." They provided a living link to the glorious, flowering years of jazz, passing on their wisdom as an active oral tradition. I was privileged to play hundreds of nights with drummer Jimmy Lovelace (a former sideman of Wes Montgomery and George Benson), drummer Frank Gant (of Ahmad Jamal and Sonny Stitt's bands), and Smalls Records artist, legendary pianist Frank Hewitt (who uttered the quote above). I enjoyed meaningful interactions with trumpeter Tommy Turrentine, saxophonist Charles Davis, trombonist and euphonium expert Kiane Ziwadi, and drummer Billy Kaye. Perhaps encouraged by the interest of the younger musicians, or perhaps despite the clamoring of the young mob, these veterans came to play, and they played great. The music heard on this recording was created, re-created, honed, showcased, and eventually, largely discarded with the close of the club in 2003. Since then, Smalls has re-opened, but for me, it's an epilogue; the daily jam sessions until 7:00 a.m. don't happen anymore, and if they did, I couldn't do them -- I have two small children at home. Now, in my mid-thirties, I am touring frequently, teaching, recording, writing a book, working as a Finale copyist, and arranging for the likes of John Pizzarelli, Jr., Amy London and Jerry Dodgion. I organize annual multi-night performance tributes to great musicians such as Lucky Thompson and Jimmy Cleveland. I'm playing Gigi Gryce's music with Across 7 Street at the school where he taught under his secret identity in the 1970s. Together with Ari Roland, Sacha Perry and veteran drummer Leroy Williams, I'm representing the United States on an upcoming State Department tour of Central Asia, performing and educating. I enjoy a periodic night or weekend at Smalls as a leader or sideman, but it's not like the earlier years. Jimmy Lovelace and Frank Hewitt are both gone now, two of the most talented musicians and most delightfully quirky personalities I will ever encounter. They were taken suddenly, and too soon; but they are with me always. Turning to the tunes, "Aquarian Epoch" denotes the striking number of February birthdays in the Smalls enclave, which include band members Ari Roland and Jimmy Lovelace, but also Neal Miner, Jason Lindner, Leroy Williams and Mitchell Borden himself. The tune is light with a subtle humorous angle. Next is "Milton," an early composition that depicts a South American cartoon character of the "friendly monster" type that I learned about on a band tour of Chile in 1993. There's a bit of the "jump and say boo" in this song. The ballad "Safe at Home" has a dual reference, on softer nights it's for a rather co-dependent liaison I had at the time (see "A.T."), and on tougher nights, it's for the heart-breaking moment for baseball fans, when Ken Griffey, jr. stepped on home plate and ended the Yankees 1995 season. Hope or heartbreak - it's your choice. After hearing an explanation of string theory at a yoga class, I wrote "Acoustic Phenomenon" to embody the concept of sound as being the common link to all physical existence. Manhattan Valley (Frank Hewitt loved this tune) was a septet arrangement from the earliest days of Smalls, then later it was recorded with the Chris Byars Octet on Night Owls (Smalls SRCD-0013); it was quite a treat to get a turn at it with a quartet. The tune depicts the flavor of my Upper West Side neighborhood: vibrant, youthful, with plenty of Latin seasoning. Dream Dancing is the standard on which "Cliff Diving" is harmonically based, with a slight alteration in the first four measures. It was the last tune I wrote before Smalls closed in 2003 and ended the decade of seemingly unlimited jazz frolic. It really did feel like I was jumping off a cliff at the time! In "Riddle of the Sphinx," the most recent composition (2004), I attempt to portray the mystique of the dear departed Jimmy Lovelace. His love for all things Ancient Egyptian was well established; once I ran into him at the Metropolitan Museum, near the Temple of Dendur; his comment was "I'm always here on Fridays." Sacha Perry takes a break for A.T., a dual homage to the great drummer Arthur Taylor, and to the bus line Adirondack Trailways, on which a chance encounter had initiated the above-mentioned romantic interlude (see "Safe at Home"). I believe this recording conveys part of the secret of how jazz itself never grows old. In the same way I like to pick up the repertoire of 1950's giants Gigi Gryce and Lucky Thompson, here we have some key material of the 1994-2003 Smalls decade, as fresh as it was when it first echoed in the basement that centered the New York City scene, and several years the wiser. Perhaps jazz requires only the talent and dedication of its living musicians to deliver its effects, it does not belong to a specific time, place or person. The uniquely idiomatic acts of existing conceptually in the moment, creating melodies spontaneously, and rhythmically expressing real-time emotions never lose their promise. The responsibility lies with the musicians and jazz eco-system, of any given situation, to do what needs to done in order to create a scene where the music thrives and is continually reborn. And if the scene isn't right, you don't give up -- you hang in there and wait for it to open up again, for you will need to draw on your life experience at that time. For inspiration, I look to Frank Hewitt, who never stopped, and to Jimmy Lovelace, who wore only black, white and gray. The producer would like to thank Debbie Millman, Jeff Brown, Paul Sahre, Tom Currier, and Marcy Granata without whose gracious assistance these productions would not be possible.